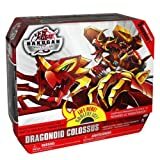 Bakugan Colossus Dragonoid is one of a variety of popular selling toys from the popular TV show, and is still as popular several years after its inception. This particular Bakugan model is popular due to its ability to connect with other related action figures that, once connected, make up one big battle Dragonoid. That may not mean much to moms and dads but it means everything to fans of the hit series. The battle gear aspect is designed to lend a Bakugan warrior's regular strength more impact - going from powerful to super powerful to super powerful. There is a series of 37 different Battle Gear Bakugan's in the collection and they're all designed to add power, strength and might. 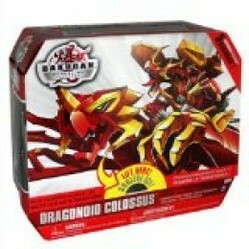 The most popular Colossus Dragonoid's are featured below. This Bakugan Dragonoid Colossus was an original from the Battle Brawlers collection, which revolved around the Gundalian Invaders. Dragonoid is viewed as the most awesome of the species and highly prized by young boys everywhere. According to the show, his armor is super high-tec and can withstand almost anything thrown at him during battles. This particular set comes with four Battle Gear Bakugan that connect with the singular Bakugan (I know - confusing!) and the separate action toys connect to form one large figure that becomes - in the words of many a fan - awesome. A great pack, currently on offer and well worth snapping up at it's current price. This is Dragonoid Bakugan himself - the best, the mightiest and the most noble. Plus he's potentially the most sought after model by young Bakugan collectors. The action figure comes with a couple of trading cards, which are important in the accompanying game that youngsters can play with each other as an alternative method of enjoying the toys. It's durable, built to stand up to lots of wear and tear and will occupy its young owner for hours on end. It's part of the Battle Brawlers range and can connect and interact with any other in the collection. A cool most-wished for Bakugan, sure to delight the recipient and well worth the price for the fun and enjoyment it will provide. This is a pack of seven Dragonoid Bakugan and comes complete with lots of potential for variety. The main figure is Dragonoid himself, the rest being made up of the six 'Trap' - which are a variety of Pryus characters that (in the series) interact with and support the main character. They can all be played with separately or - the really cool part - connect together and make one huge, super powerful Dragonoid. If that's all a little confusing, just remember back to the Power Rangers and how they worked. Some were stand alone action figures (the enemy ones) and some connected together to make the characters more awesome, more formidable. Just like the Bakugan, which are the current and up-to-date version. A cool pack of action figures, innovative and well worth buying as a Christmas gift or for a birthday.